Venture out, whatever the weather with the Phil & Teds Voyager Storm Cover, made perfectly for the voyagers main seat to keep you warm and dry with a smart custom fit design for airflow and breathability. The Phil & Teds Voyager Sun Cover prevents sunny daze, bugs & rays with coverage for the main seat of your Voyager. Keep cool and relaxed with this bespoke sun cover. A great pushchair accessory. The Phil & Teds Voyager Pushchair has a 4 in 1 spacious modular seat which adapts to grows with your family. Starting off in a lie flat mode bassinet form for newborns used both on and off the pushchair. Perfect for keeping baby secure if visiting family and friends. When your baby is old enough, the seat converts to a reversible (parent or forward facing) upright seat. The Phil & Teds Voyager Pushchair can also become a travel system when using Phil & Teds Car Seat Adaptors. A 4 in 1 modular seat (parent facing, forward facing, lie flat and bassinet). For parents, the Phil & Teds Voyager Pushchair boasts a parcel tray capable of holding up to 10kg, a hand operated parking brake for convenience, wipe clean fabrics which can also be easily removed and a multi height adjustable handle. 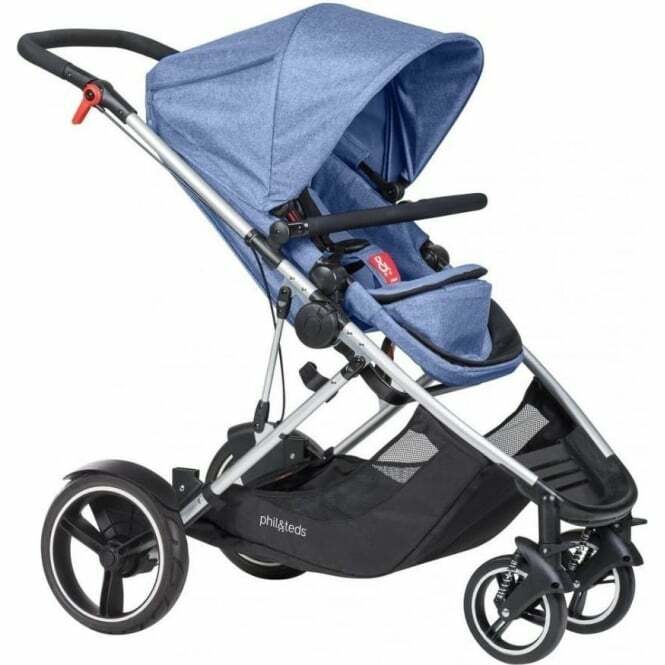 For baby, the sunhood, a safe and easy to use 5 point harness, bumper bar and large seat measuring 61cm in height for ultimate comfort. The front wheels are 8" aeromaxx (puncture proof) and the rear wheels are 12" aeromaxx. 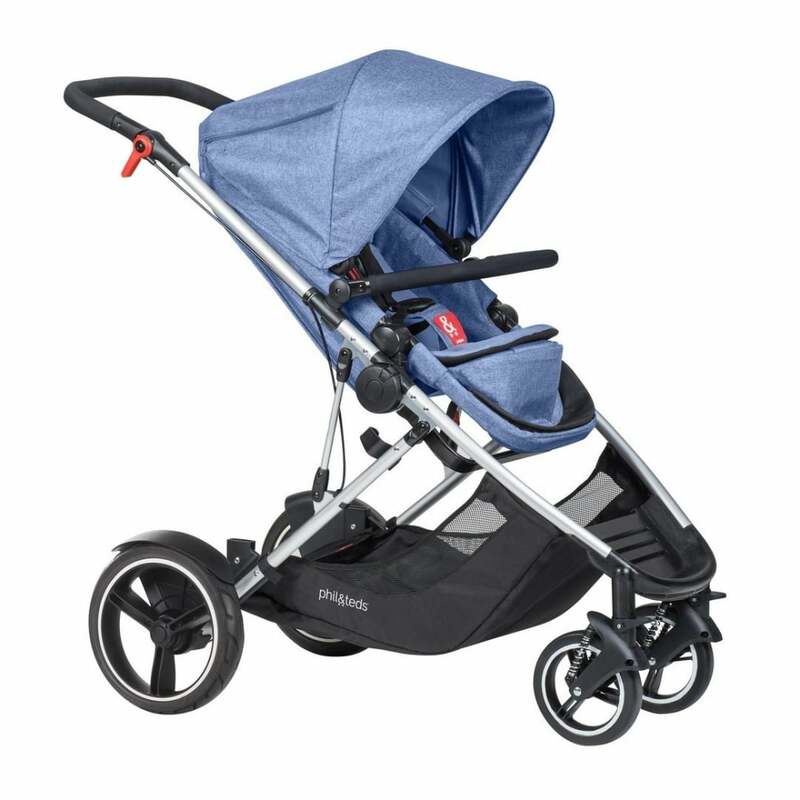 The Phil & Teds Voyager Pushchair has a lightweight aluminium frame which means it weighs only 13.3kg. Showing our 3 Phil & Teds Voyager Pushchair reviews with an average rating of Array. Would you like to write a review? Lovely big stroller, it's definitely going to keep our family going until we no longer need a stroller! We also often use the bassinet off of the buggy when our little boy falls asleep in it (which we thought would just be a novelty feature but it's very handy). It's also easy to fold and put away - I'd definitely recommend trying out the voyager. We have twins and this has saved us a lot of money buy not having to buy additional bassinets (like other brands). We take this buggy everywhere and although it can be a little heavy when fully loaded with babies and shopping, it's still easy to get around the shops. The buggy itself is really roomy and is almost effortless to push. I really like the the hand brake and how the seat can be turned around to face different directions.